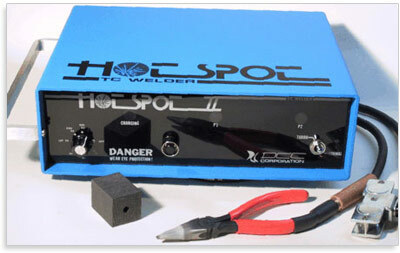 The principal difference between the HotSpot II and the standard HotSpot is its heavier wire welding capability. The HotSpot II can handle wire pairs as heavy as #14 gauge. It can also close larger tubes than the standard unit and can do light duty stud welding as an aid in wire harness attachment and in insulation blanket installation. The HotSpot II operates only from AC power. 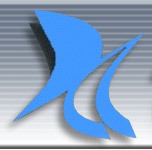 A battery-powered version of the unit is not offered. Its less than #14 weight and compact design make it a very portable package. QUICK ACTION The HotSpot II is light and portable so you can move it right to where you need to make and attach thermocouples. The actual welding time in less than a second and the short recycle interval, even at full power, will allow you to make 6 or more welds a minute. ECONOMICAL Making and installing thermocouple junctions using DCC's HotSpot II is extremely economical. Freestanding beads can be fabricated or junctions welded to fixturing hardware or directly to the surface being sensed, at the rate of 5 to 10 a minute. There is no need for elaborate set-ups or specially trained operators. 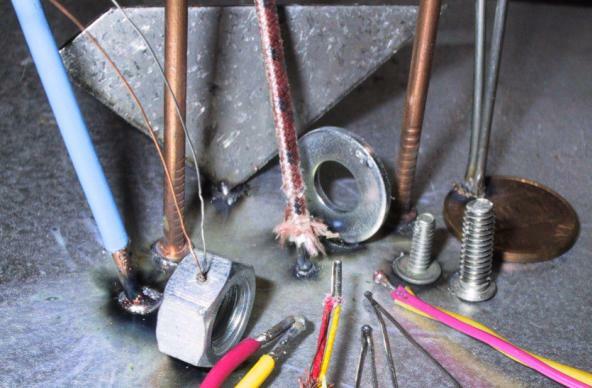 Skip the pre-planning, expense, and delays involved with purchasing thermocouples outside or having them made through another department. EASY-TO-USE Anyone can quickly become proficient in the use of the HotSpot II. While sophisticated internally, the HotSpot II provides the operator with a firing button and a simple on/off and energy level adjustment. A weld is generated by holding the bared end of the thermocouple wire to the bead forming graphite electrode or the surface to be sensed, while pressing the firing button. FLEXIBLE The HotSpot II welder is a dual range high-energy unit that has the versatility to provide fine control as well as the high power capability needed for heavier wires. Front panel indicators and controls allow the operator to easily monitor the status, set the energy level, and initiate a weld cycle. CONTROLS - Provides energy adjustment control, dual 2 position energy range switch, and LED displays to indicate charging and energy storage status. The HotSpot II is powered from the AC line through a step-down transformer and rectifier. Front panel indicators and controls allow the operator to easily monitor the status of the unit, determine the level of energy to be transferred to the storage capacitors, and initiate a weld cycle. The maximum power output of the HotSpot II is approximately 250 Joules. The power level is set by the position of the front panel control knob. The power ranges, normal (low) and turbo (high), are selected by a two position toggle switch. Initiation of the welding discharge is controlled by a snap action push button switch. The range switch and power level control set the voltage to which the energy storage capacitors are charged. Peak voltage on the low range is approximately 35 VDC and on the high range 75 VDC. The stored energy is proportional to the square of the capacitor voltage. Increasing the setting of the control knob will cause the capacitor to be charged to a higher level. However, decreasing the setting will not immediately reduce the value already stored so a welding cycle will always release an energy pulse equal to the highest power setting since the last recent discharge. A resettable circuit breaker in the primary AC line is accessible on the unit's back panel and protects against damage from internal circuit shorts and similar fault conditions. Price Includes: HotSpot II Welder and Metal Case, Standard 6 " Wire Holding Pliers, Eye Shielding Protective Goggles, Carbon Block, Grounding Magnet, Instruction Booklet. Price Includes: Holding Vice, Diagonal Cutter, Miniature 5" Wire Holding Pliers, High Temperature Utility Cement, Dressing File, Extra Quick Release Attachment Ferrules, Magnifier Loupe.